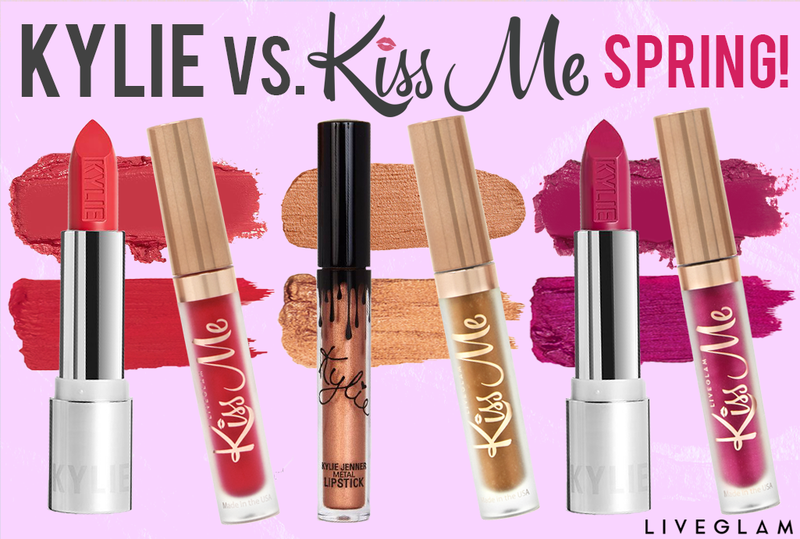 Kylie vs. KissMe: Spring Edition! Spring has sprung, and so have our new LiveGlam KissMe lippie shades for April! To celebrate, we’re back with another Kylie Cosmetics vs. KissMe comparison to show you some fabulous dupes for a much cheaper price. If you’re new, KissMe is the world’s first liquid lippie club created by LiveGlam! It’s a monthly subscription where you get 3 new lippies delivered straight to your door every month for just $19.99. So, instead of just 1 liquid lippie, you get 3 beautiful shades for the price of one Kylie Cosmetics lipstick. How can you pass that up?! You may tend to shy away from metallics, but this bronze shade actually compliments lots of skin tones and looks breathtaking! 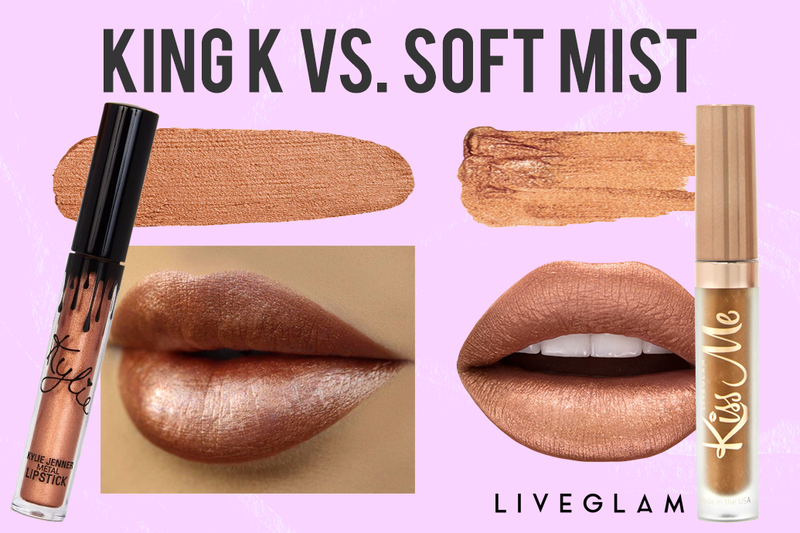 Soft Mist from our April Collection is the perfect dupe for King K from Kylie Cosmetics. Both are soft metallics that shimmer like morning dew in the Spring. If you don’t want to wear Soft Mist alone, you can always layer it over top your favorite liquid lippie to give it a more dramatic, eye-catching look! King K is $18, while you can get our KissMe lippie in Soft Mist plus the 2 other lippies featured in April’s collection for $19.99 total. No one will be able to take their eyes off of you in our matte pinky-coral shade, Poppy! This color is a great dupe for Kylie’s Créme Lipstick in Amore, but a liquid lippie version. Our long-lasting formula feels flexible and comfortable on the lips, smells delicious, and is cruelty-free. 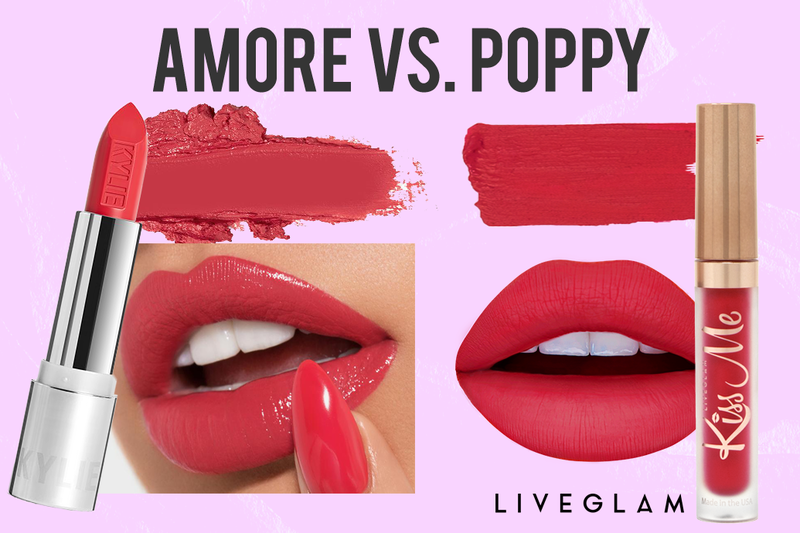 We guarantee that Poppy will be your go-to shade this Spring! Amore is $17, while you can get our KissMe lippie in Poppy plus the 2 other lippies featured in April’s collection for $19.99 total. We love a good silky, satin finish, and our KissMe shade in Butterfly has just that! This gorgeous deep fuchsia shade will have you feeling like a Social Butterfly, and is a nice liquid lippie dupe for Kylie’s Créme Lipstick in Raspberry Charlotte. 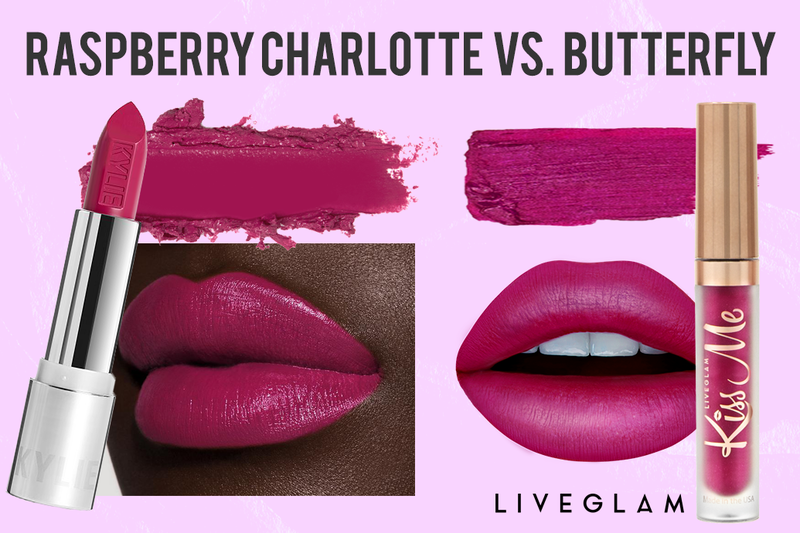 Raspberry Charlotte is $17, while you can get our KissMe lippie in Butterfly plus the 2 other lippies featured in April’s collection for $19.99 total. While we’re at it, let’s also give you some dupes from our lovely March Collection! Although this is a previous collection, you can still get these unique shades through Trade or Rewards, just head to your LiveGlam Dashboard. 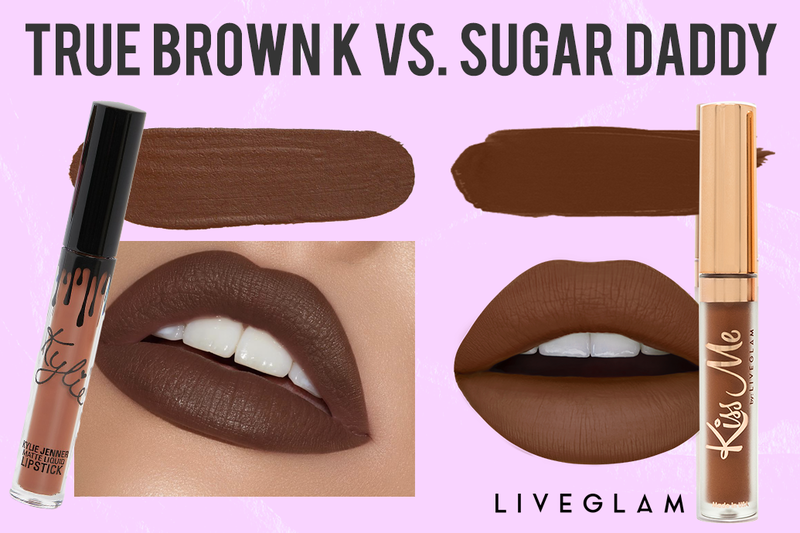 Everyone needs a good brown lippie in their collection, and Sugar Daddy from our March Collection will fuel that sweet tooth! Look as delicious as chocolate in this matte, warm brown shade, and use it as a dupe for Kylie’s True Brown K shade. The True Brown K lip kit is $29, while you can get our KissMe lippie in Sugar Daddy plus the 2 other lippies featured in March’s collection for $19.99 total. Our brick red shade in Tease looks stunning on all skin tones, and you’ll definitely be feelin’ yourself! If you’re not a fan of bright colors, this is the perfect lippie to rock all-year-round. It’s also a dupe for Kylie’s lip kit in Leo! 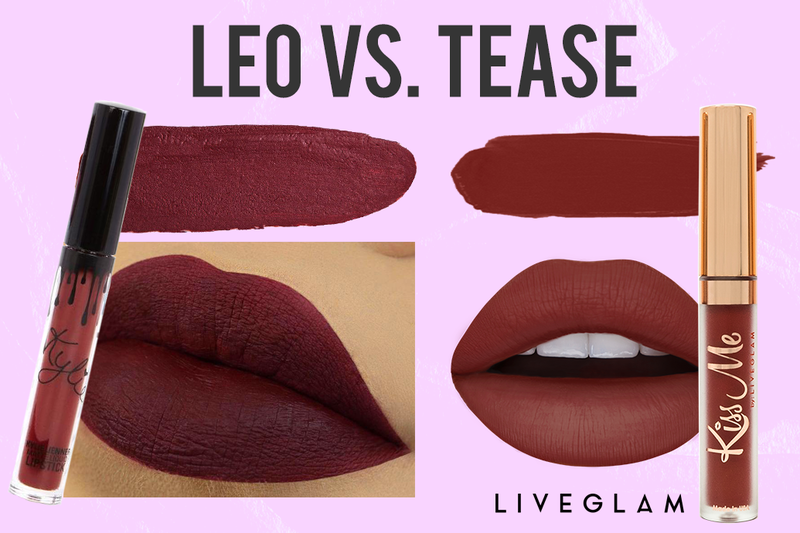 The Leo lip kit is $29, while you can get our KissMe lippie in Tease plus the 2 other lippies featured in March’s collection for $19.99 total. Go super bold this Spring with our bright orange lippie in Crush! There’s no doubt you’ll be the center of attention wearing this pop of color on your pout, and it works great as a dupe for Kylie’s 22 shade! 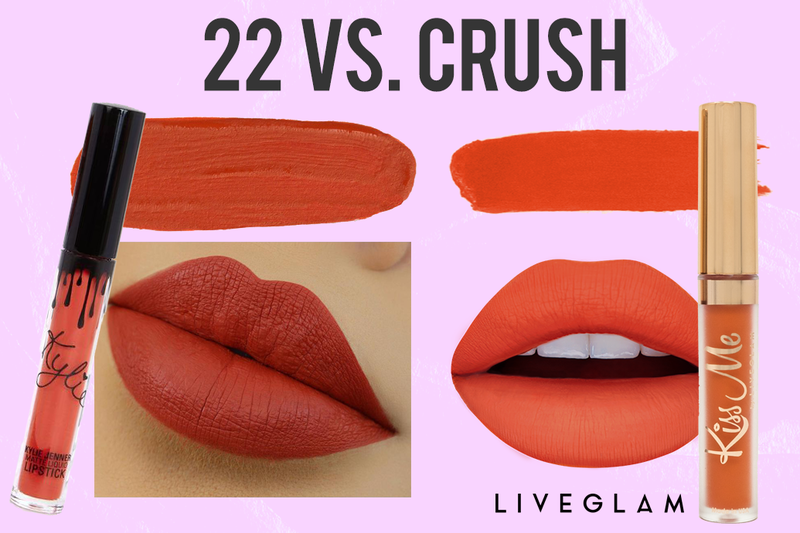 The 22 lip kit is $29, while you can get our KissMe lippie in Crush plus the 2 other lippies featured in March’s collection for $19.99 total. If you aren’t already a member, be sure to sign up for our LiveGlam Lippie Club, KissMe, to get these fabulous, affordable lippies every month! You can skip Collections, trade lippies, and cancel at anytime. You can also rack up points each month and get even more gla-mazing goodies through our Rewards program. Learn more here! What’s your favorite dupe pairing? Let us know in the comments!